Confidentiality is vital when working within the healthcare sector. You are privilege to information that should only be shared with others for the benefit of the patient. If you are a receptionist and are unsure of confidentiality issues – ASK your Practice Manager. Your Surgery could very well end up in Legal proceedings through lack of confidentiality. 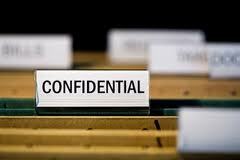 Managers – ensure that your staff has a good understanding of confidentiality. I had reason to dismiss a member of staff that continually read patient records for her own gain – in easy terms she was being nosy and wanted to see what was wrong with the patients. This is unacceptable. Every proposed use or transfer of patient identifiable information within or from an organisation should be clearly defined and scrutinised, with continuing uses regularly reviewed, by an appropriate guardian. Action should be taken to ensure that those handling patient identifiable information – both clinical and non-clinical staff – are made fully aware of their responsibilities and obligations to respect patient confidentiality. These principles have been subsumed into the NHS confidentiality code of practice.